Rescue workers on the scene after a lorry truck plowed through a Christmas market on December 19, in Berlin. 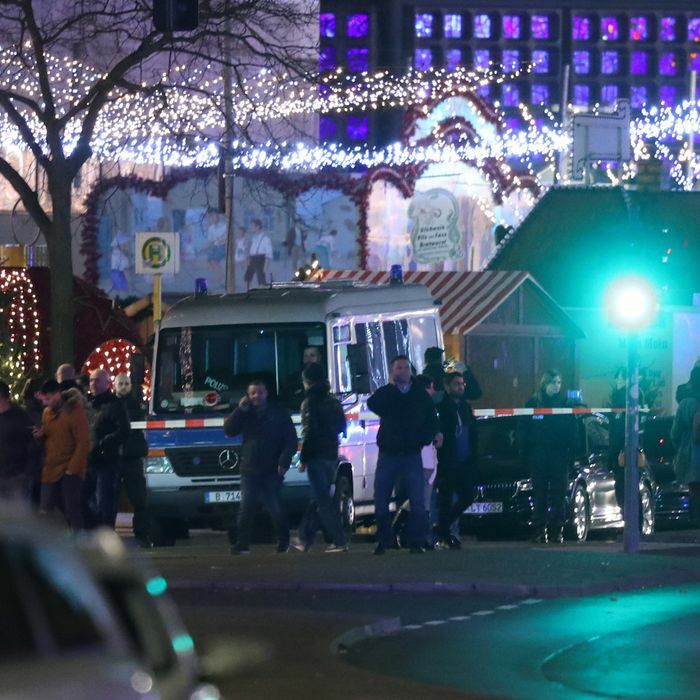 A truck plowed into a Christmas market in Berlin Monday night, killing at least nine people and injuring at least 50. Authorities are investigating the incident as a possible deliberate attack, though police cautioned against jumping to conclusions because the motive is still undetermined. Federal prosecutors are in charge of the investigation, says Bild, a German news outlet. The identity or identities of the people driving the truck are also not known. One person was found dead in the passenger seat. Another “suspicious” person was arrested near the scene. That man was originally identified as a suspected driver, but Berlin police said that was not yet confirmed. According to the Guardian, the vehicle, a Scania, is registered to a Polish trucking company. The truck departed Italy and was en route to Berlin to unload its cargo, before heading back to Poland, but the truck’s owner — who was a cousin to the driver — said he had lost contact with him in the afternoon. Police have speculated that the truck — which was loaded with steel beams — might have been hijacked, but from a “Polish site.” Bild reports that passenger found dead is believed to be the Polish truck driver. Police and ambulances swarmed the area near the Kaiser Wilhelm Memorial Church, a landmark and popular attraction in the public square of Breitscheidplatz, where the massive truck crashed through the festive and bustling plaza full of revelers. Authorities warned people to keep away from Breitscheidplatz, which had been transformed into a disaster scene: crushed vendors’ stalls and mangled Christmas lights and garland. This Berlin incident echoes an attack in July, when Mohamed Lahouaiej-Bouhlel, a French resident of Tunisian descent, rammed a semitrailer into a crowd gathered for Bastille Day festivities in Nice, killing more than 80. He was suspected of being self-radicalized, but had no direct ties to ISIS, which claimed the attack. 1) Reports that #ISIS has claimed responsibility for #Berlin #Germany attack are false. No such claim as of yet. Officials in the United States appear to strongly suspect a deliberate act, with U.S. National Security spokesman Ned Price calling it a “horrific incident,” which “appears to have been a terrorist attack.” German Chancellor Angela Merkel, who has been under attack from the right for her refugee policies, described the incident as “shocking” through a spokesman. “We mourn the dead and hope that the many people injured can be helped,” the spokesman said on Twitter. This is a breaking-news post and will be updated as more information becomes available.